14 manufacturers provide support to Valve Steam Machines, indicating a craze that was confirmed at CES 2014. 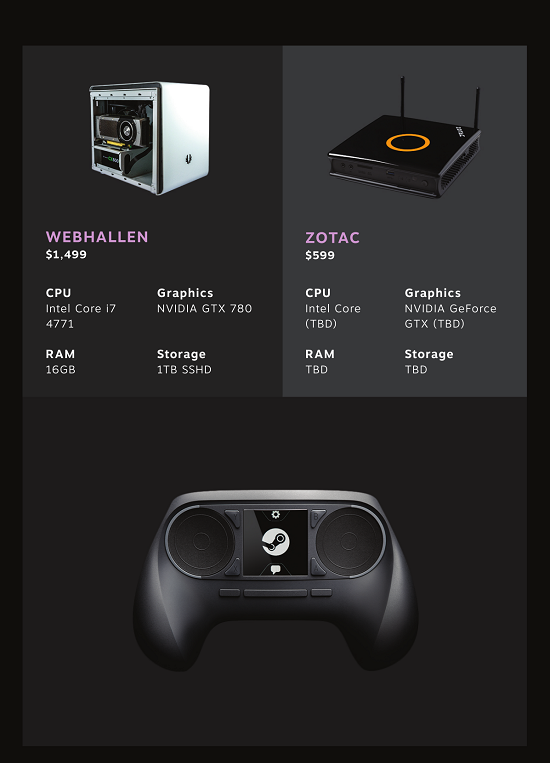 On the occasion of the Consumer Electronic Show 2014, Valve announced the list of its partners builders Steam Machine project. These computers running SteamOS (the Linux distribution developed by Valve), vying instead of consoles by allowing players to take advantage of Steam games in a dedicated environment on a TV screen. Steam has already presented to the public its prototype machine Steam last year, but other manufacturers have also been invited to submit their own versions. 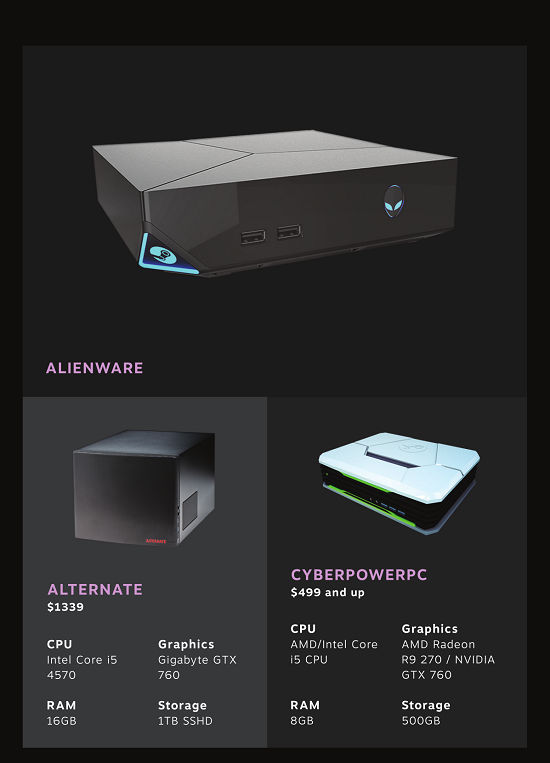 So far, we had already seen a preview of Steam developed by both companies, iBUYPOWER and Digital Storm machines, but Valve took advantage of CES to unveil 12 new partners: Alienware, Falcon Northwest, CyberpowerPC, Origin PC, Gigabyte, Net. , Webhallen, Alternate, Next, Scan Computers Zotac and are therefore now also part of the manufacturers involved in the program. Note also that the French Materiel.net announced to develop a prototype, which brings the total builders Steam Machines 14. Information about each prototype are still pretty scarce, but the first glimpses give hope a wide variety in terms of price and performance depending on the manufacturer selected. 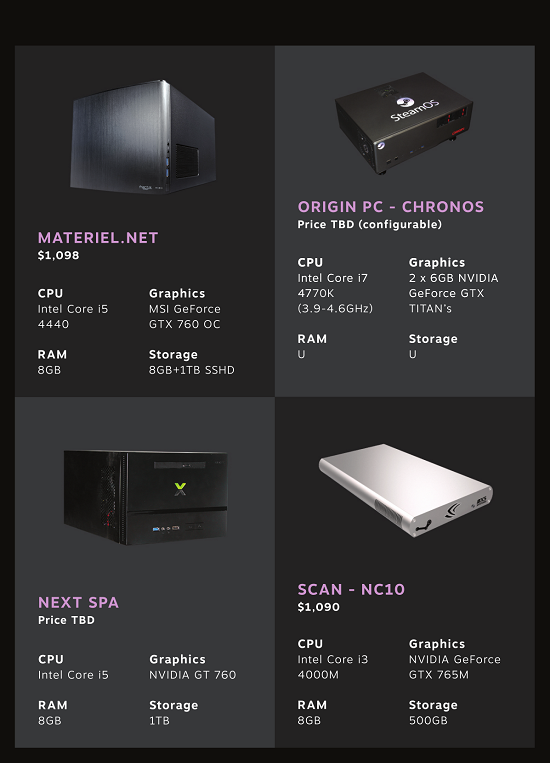 Materiel.net and offer its Steam Machine at $ 799.99, unlike that of Digital Storm which will move towards the high end with a rotating around $ 2 500 price. The difference on performance, each manufacturer has chosen its components. If Materiel.net has opted for a Geforce GTX 760 and a Core i5 5540, advanced by Falcon Northwest version of GeForce GTX Titan propose it, the high-end card from Nvidia. 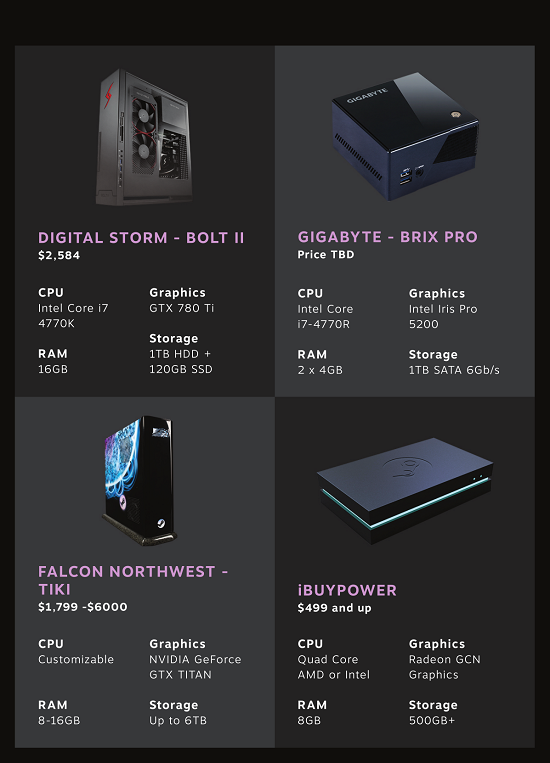 Steam of low-cost machines will be available, a mainly niche occupied by CyberpowerPC manufacturers, Zotac and iBUYPOWER their alternatives to less than $ 600. But many details remain to be defined and all partners have not yet submitted the price and performance of their respective prototypes. 14 leading manufacturers in its strategy, Valve strikes a big blow by showing that primary manufacturers are ready to follow initiated by the editor Steam movement. A shift that remains far from being negotiated. The great unknown of the equation? Publishers of video games, which hitherto reluctant to port their games to Linux. The OS developed by Valve for its Steam Machine program based on free core, it remains to convince them of the value of these hybrid machines, consoles mid-mid-PC, based on a poorly known operating system and very different habits.